The Cycling Embassy of Great Britain, in collaboration with Cambridge Cycling Campaign, will be going on an Infrastructure Safari ride in Cambridge tomorrow, Saturday 23 March. Full details here. 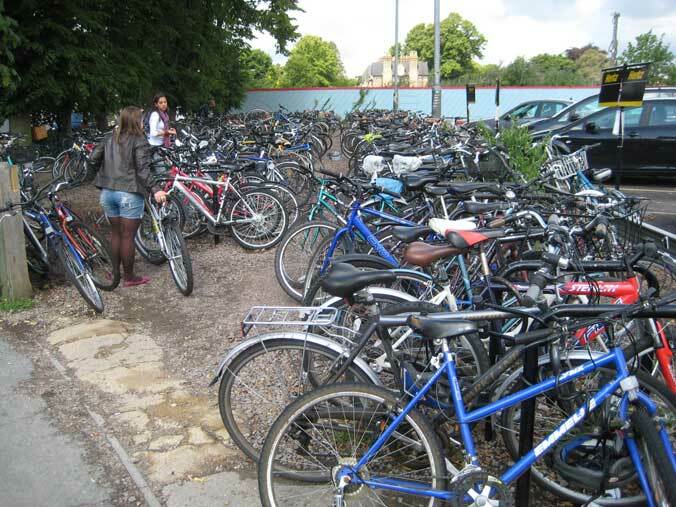 Everybody is welcome; bikes can be hired at Cambridge Station, or you can bring your own. It promises to be an interesting (but cold) day out. Thanks to CCC members for offering to show us around their city. I know Cambridge pretty well, as I lived and cycled there for a year 26 years ago. I've been there for the odd day on more recent occasions, the last time two years ago, but not re-explored extensively. It will be interesting to see if this ride can show me that much has changed in the last 26 years. My impression, from my more recent visits, is that is has not, unfortunately. As with other British towns, in stark contrast to Dutch and German ones, the infrastructure changes only extremely slowly. There seems to be a general problem we have in the UK in changing our environment for the modern world, which, it seems to me, it does not bode well for either our environmental or our economic future. The level of investment in our infrastructure and environment is just too low to keep it up both working efficiently and up to date. This manifests itself at the level of the obvious crumbling of our road surfaces, that everyone can see, the poor performance of our rail network, and of the London Underground, as well as at the strategic, policy level that causes, to a Dutch or German person, our cities to look just like theirs, but 50 years in the past, in terms of the way that the roads and public spaces are used. David Hembrow has written about Cambridge, and I agree with his conclusions. While the Cambridge cycling infrastructure is probably slightly better than the average for a similar-sized town in the UK, compared to towns in the Netherlands and Germany, it is non-existent. The relatively high rate of cycling in Cambridge, probably the highest in the English-speaking world (the actual rate is hard to pin down precisely, but it is probably between 15–20% of all journeys, as 18% commuting to work is reported by the 2011 census) is clearly dependent on special factors, which as Hembrow emphasises, cannot be replicated anywhere else. 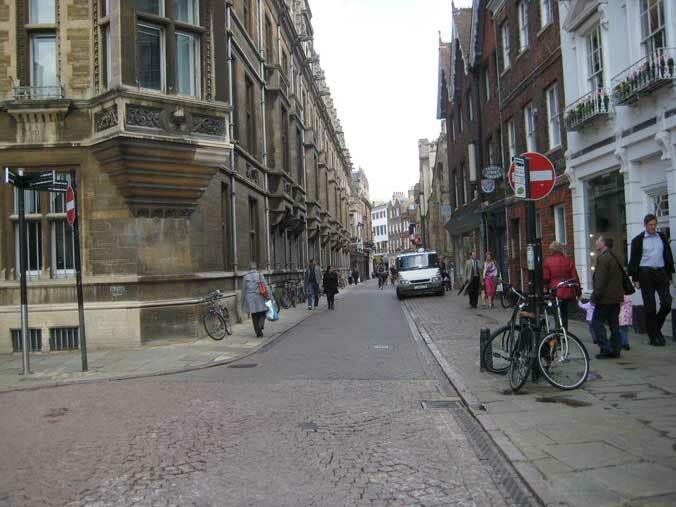 The main one is that the University and City of Cambridge, by an agreement between them, actually prevent students from keeping cars in the city. I also agree with Hembrow, from my experience of living in Cambridge, about cycling there being very much a gown-versus-town thing. 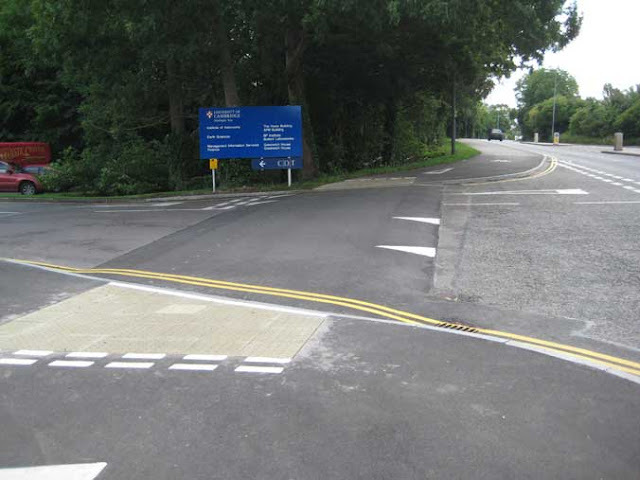 It's intimately connected with the university, and the motoring townspeople remain as hostile to cycling and cyclists as those anywhere in the UK (or at least they did 26 years ago, and reports on blogs suggest not much has changed recently). In fact, I'd say that 26 years ago they were more hostile than Londoners to cycling, as the usual British "war on the roads" was overlaid with the Cambridge-specific, permanent, "war on the students". 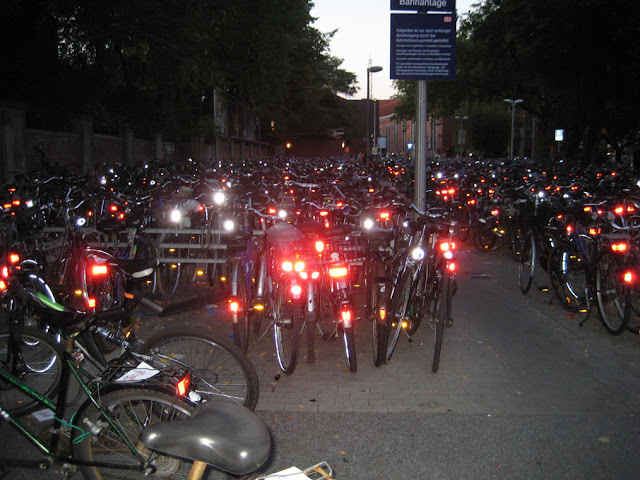 I worked at government offices in Cambridge, and few employees there cycled to work. They mostly lived in the suburbs of Cambridge and outlying villages, and they all drove, and wouldn't have conceived of doing anything else, as Cambridge people. Cycling, along with many other activities of students, was regarded as pestilential, something the city should do its best to stamp out. It certainly seemed to be trying at that time. I had the good fortune to visit, in 2008, Germany's top cycling city, Münster, in North Rhine-Westphalia. Münster makes a good comparison to Cambridge. I was struck by how close the similarities are, in fact, in atmosphere, and architecturally. (Münster was very badly damaged by bombing in 1944, but has extensively rebuilt its old buildings, such as the cathedral, university, and the Rathaus, or City Hall, in which the Peace of Westphalia was signed in 1648.) Münster has the third-largest university in Germany, with 50,000 students. It is a much larger city than Cambridge, and less isolated, having itself a population of 270,000, and being the centre of the Münsterland semi-urban area, with a population of over two million. However, it has a tight historic centre very reminiscent of Cambridge, with a large market square, the Domplaz, surrounded by small streets which are encircled by the ring defences of the mediaeval city. The mostly post-war suburbs are arranged around straight arterial roads heading out of town. It is flat, it is full churches, pubs and restaurants, and it is full of cyclists. 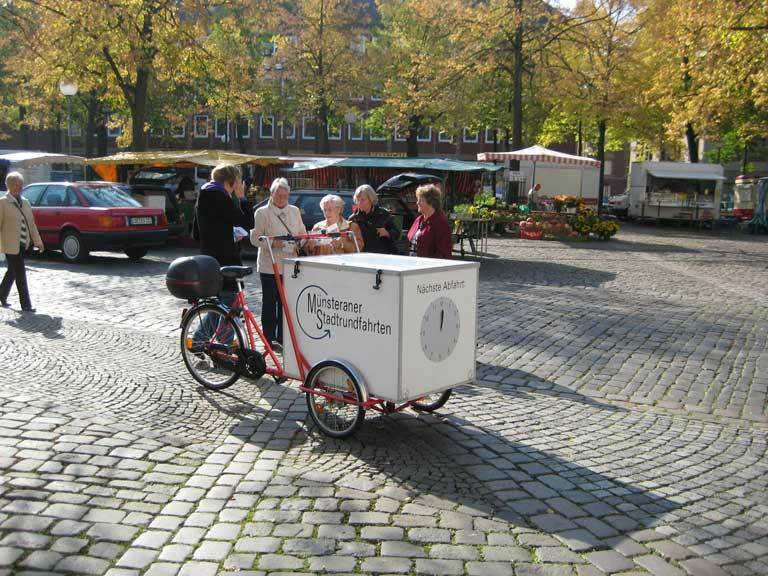 Over the past two or three decades Münster's leaders have made a deliberate, explicit effort to make it the greenest city in Germany, and indeed the most liveable city in the world (an accolade they received in 2004). 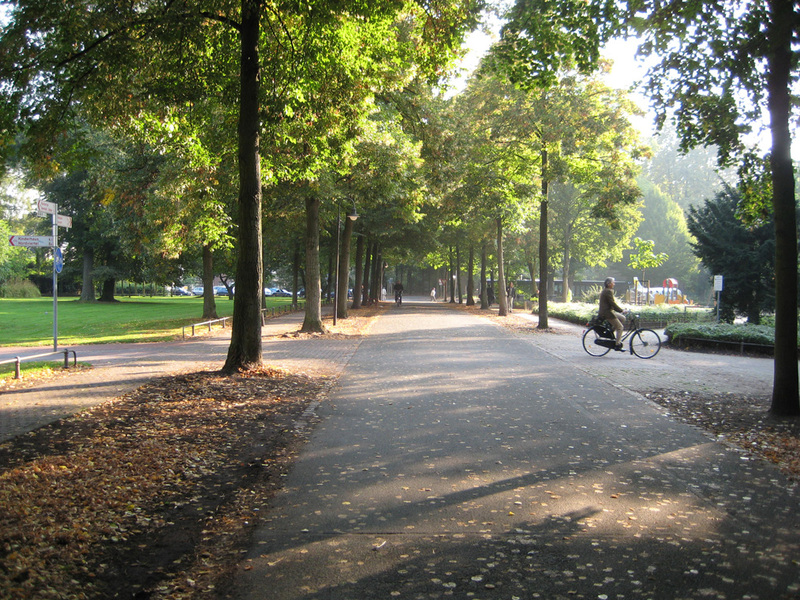 Contributors to this status are the beautiful and well-maintained public spaces and facilities, including the many parks, and the excellent public transport, but the most obvious part is the cycling. 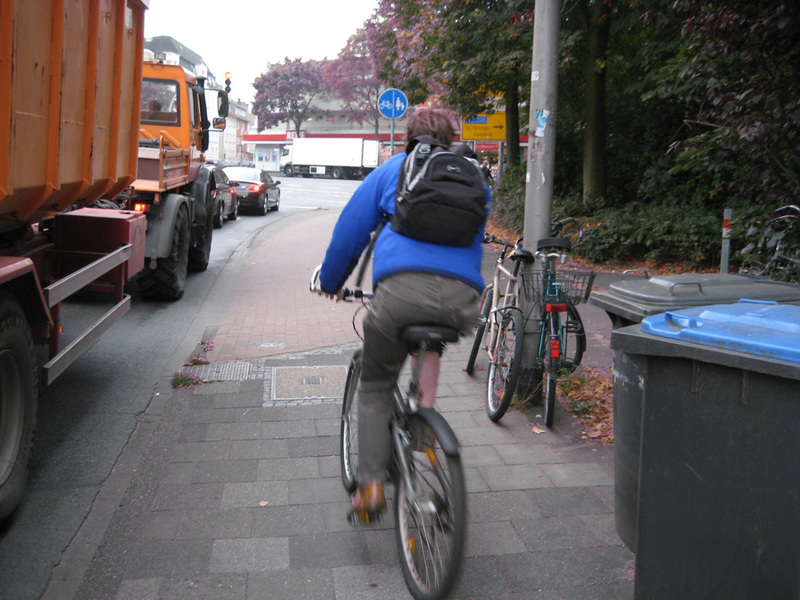 Cycling accounts for 38% all journeys made in Münster, up to the levels in the highest-cycling Dutch towns. You see all kinds of people cycling in Münster, for all kinds of purposes, in specialised clothes and in ordinary clothes, on all kinds of human-powered vehicles: parents transporting young children, children cycling to and from school on their own, people moving goods with cargo bikes, bikes used as tourist taxis, people racing around on recumbents, elderly people out for a social ride. It looks quite different to the Cambridge cycling profile, which is still mostly, to my observation, just the students. The reasons for this massive cycling culture and wide demographic are not hard to see. Münster has a well-developed network of segregated cycling infrastructure on main roads, supplemented by home zones, where motor speeds are kept down and most motor traffic is kept out, Fahrradstrasse or bicycle streets, where cyclists have priority and may not be overtaken, bike exceptions on the many one-way streets in the old city, shared spaces (with pedestrians and buses) in the city centre, where motor traffic has been eliminated apart from essential deliveries, and wide paths through the parks, separated from the pedestrian paths. 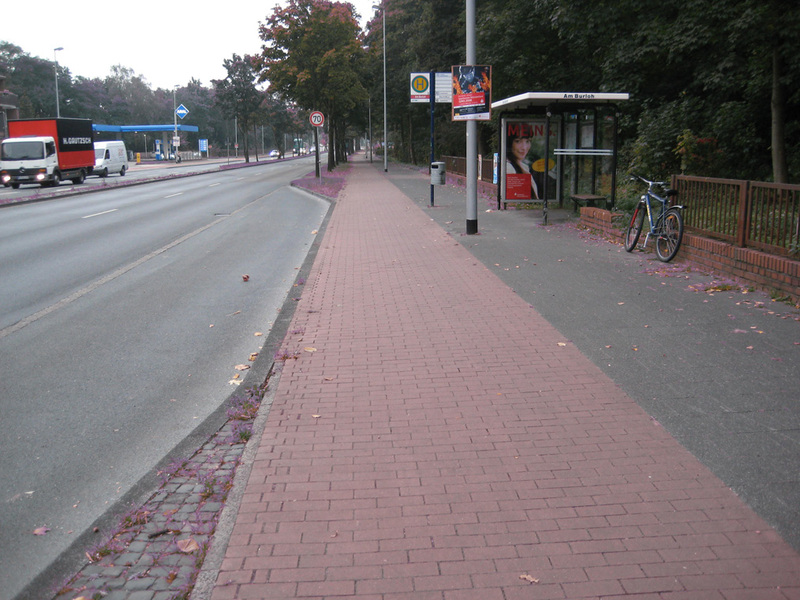 One-way cycle track with junction treatment on the main road northwards out of the centre of Münster. 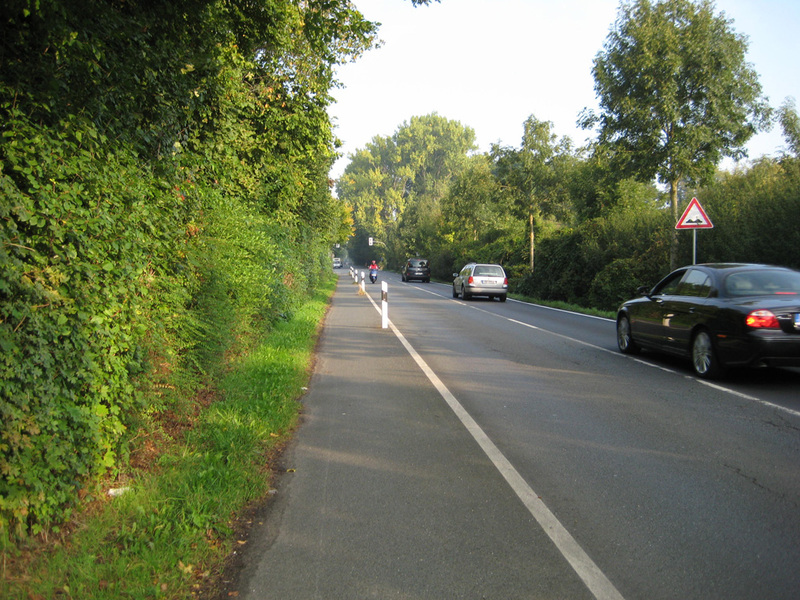 There is a cycle phase to the signals which is simultaneous with the straight-ahead phase for motor traffic on the parallel road, so there is no loss of priority compared to cycling on the road, but traffic crossing the track must give way (and it does). General character of the cycle tracks on the arterial roads in Münster, showing bus stop treatment. 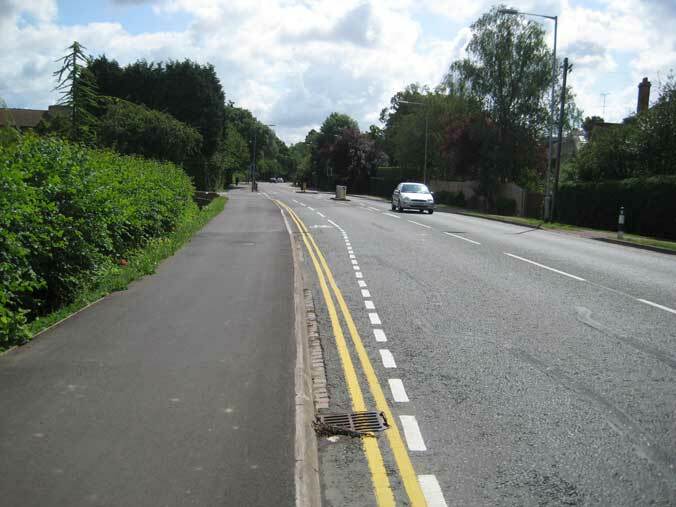 They are not typically as wide as Dutch tracks, and are often at pavement level, but separated from the pavement by different surfacing and a line of street furniture or trees. They are, however, fairly continuous, and form a coherent network. Probably the most important of Münster's cycle facilities is the ring route round the old moat surrounding the ancient city. Where this crosses roads it has priority. 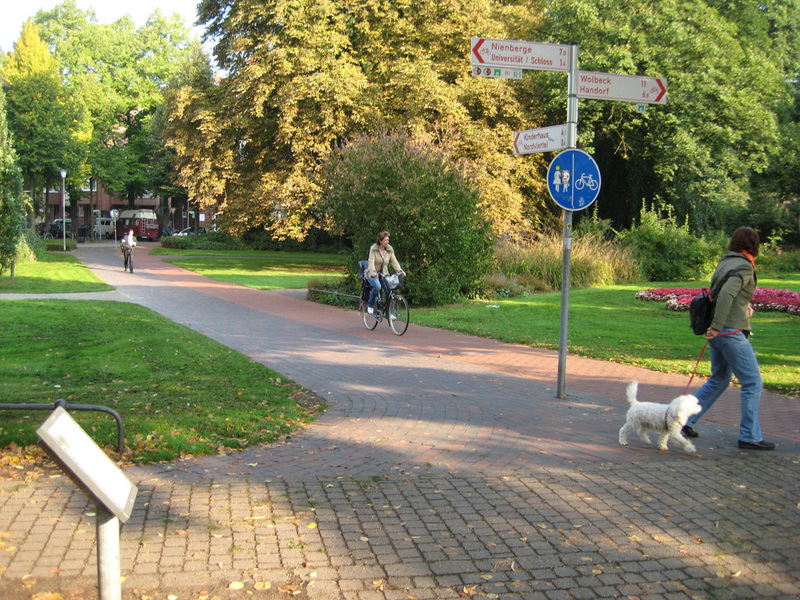 Here you see the width of the path, and the Dutch-style utility bikes which are common here. 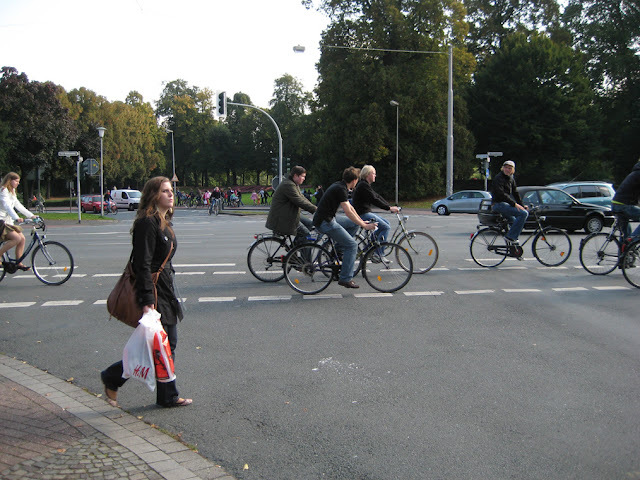 It is important to note that Münster lacked a significant cycling culture until recent times. It was developed newly, in a pre-existing urban environment, from the 1980s, through good infrastructure and planning, which owes quite a bit to the Dutch model, the Dutch border being only 40km distant. However, the cycling infrastructure in Münster is not up to Dutch standards of convenience and capaciousness, it is not as continuous, and sometimes it shows design flaws and problems of enforcement that you would not see in the Netherlands. 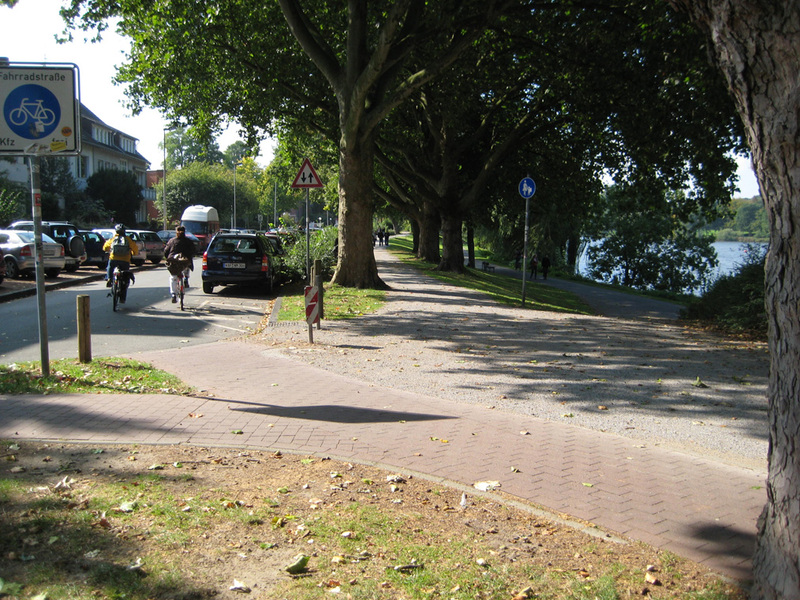 The very high cycling level in Münster is clearly a result of the combination of the demographic character of the place and of the infrastructure that has been supplied there. 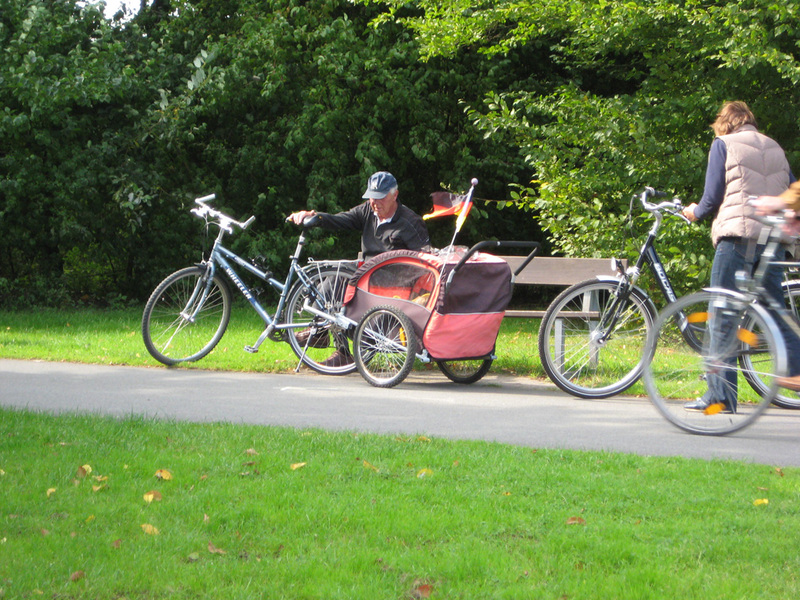 It has more cycling than some Dutch towns with superior infrastructure because of the exceptionally young demographic. 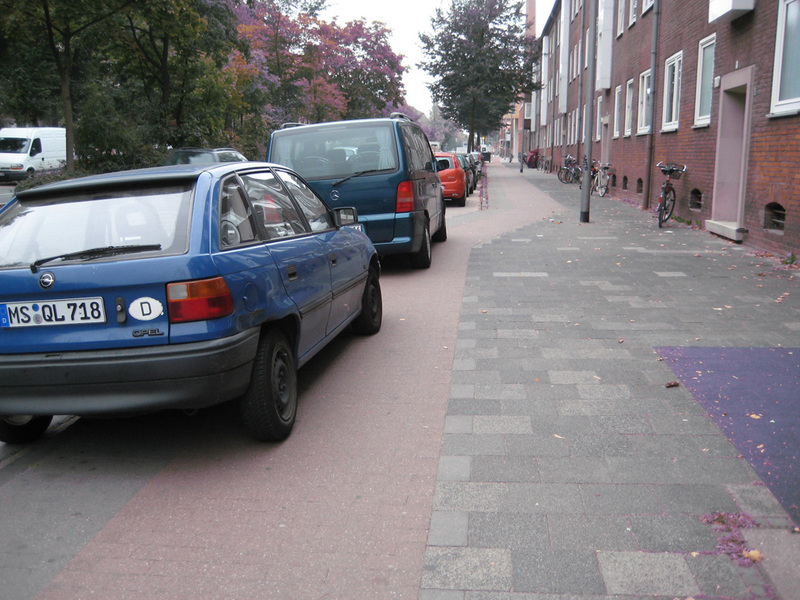 You see the same effect in some Dutch cities, where, for example, the university city of, Groningen, reputedly the highest-cycling city in the world (though it is difficult to confirm this claim), has infrastructure that is not as good as that in many other places in the Netherlands. 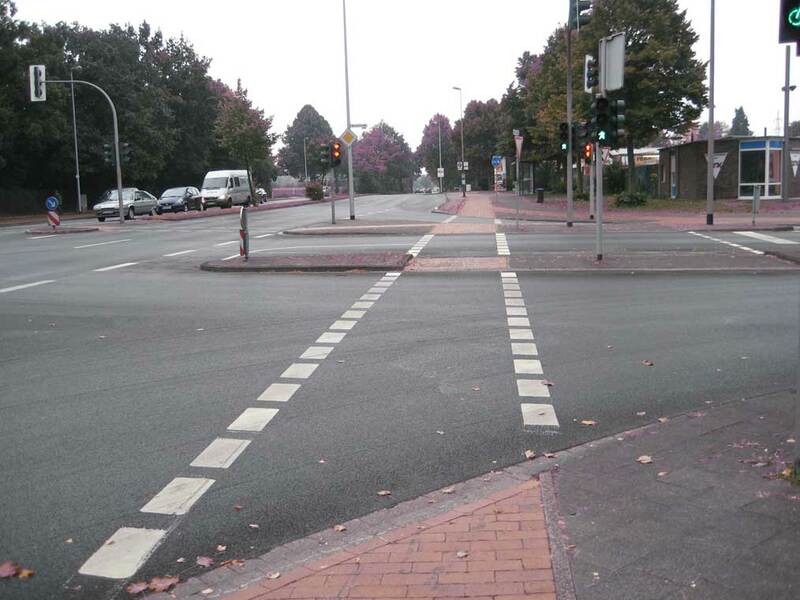 However, Münster's cycle infrastructure, less good than Groningen's, it is far beyond the quality of that which you see in Cambridge. All these three cities have the big student demographic factor, all have dense mediaeval centres highly suitable for (in fact demanding) prioritisation of the bike and of walking, and all three are flat, but Cambridge is the one that lacks cycle infrastructure to speak of, the principles on which the roads and streets are operated being much as they are in the rest of the UK. Hence Cambridge has less than half the cycling of these continental university cities (on a generous estimate), and a much less inclusive cycling profile. In the case of Cambridge, the student factor must be over twice as great as it is in Münster, as about 1 in 4 of Cambridge's population are students, compared to only about 1 in 10 of Münster's population. The high (for the UK) cycling level in Cambridge comes to be seen as much less of an achievement when you notice these facts. This lack of relative cycling achievement in Cambridge is, as I say, down to the lack of proper cycling infrastructure there. You might have expected that with the highest "natural" cycling level in the UK, Cambridge could have developed a cycling campaign powerful enough to demand and get the changes required, but this has not happened, probably because of the transient nature of the student cycling population, most cyclists not being committed to the place on a long-term basis, and because of the town-gown split. 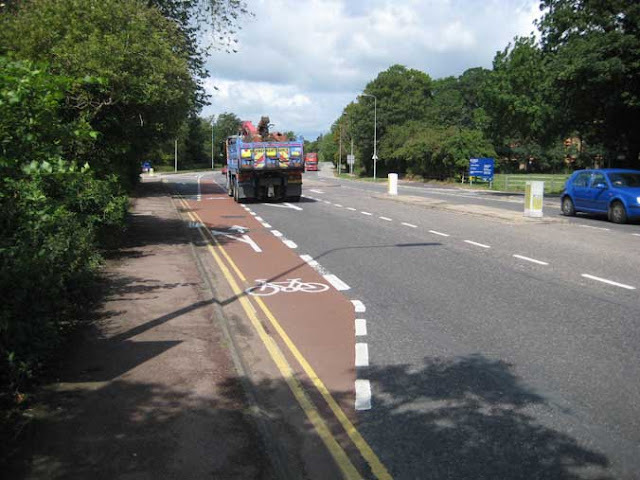 So we find that Cambridge has no network of segregated cycle tracks on main roads, it has only poor provision in parks, poorly integrated with provision on the roads, there is little motor traffic exclusion in the suburbs, connections between suburbs and estates are poor, there are no subjectively safe routes connecting the city to the surrounding villages and towns (apart from the new one provided "accidentally" as a result of the guided busway project), and even the city centre, which should be a cycling mecca, leaves a lot to be desired in terms of its cycling environment. The first thing you see, arriving in Cambridge by train, is the mess of bikes outside the station. I believe this is soon to be improved with Dutch-style multi-level parking, and it will not be before time. 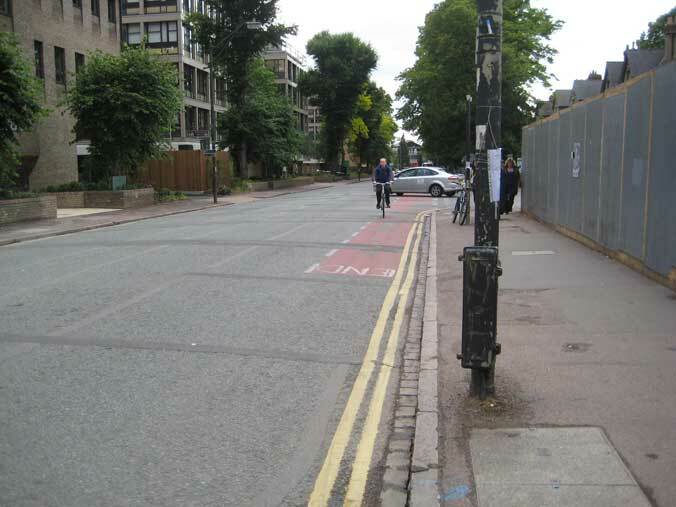 In the centre, at St John's Street, cyclists are not excepted from a no-entry that they need to use. There is therefore law-breaking and general ill-feeling. 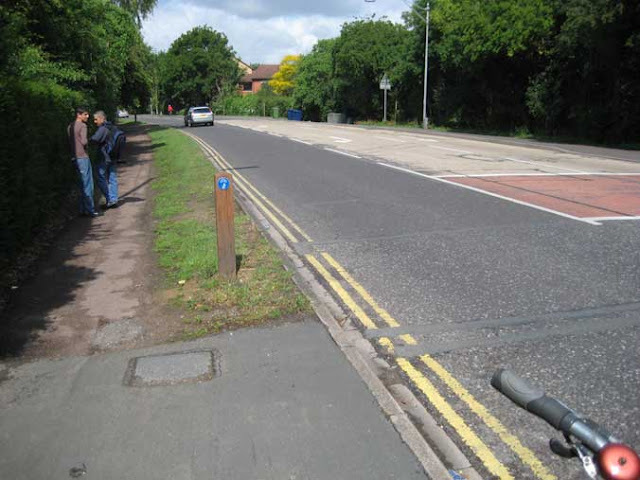 On Madingley Road we see the confused, ineffective philosophy of different levels of cycle provision operating side by side, with a shared pavement next to an appallingly narrow on-road cycle lane. What is needed here is is a proper rebuild, replacing both of these with a pavement plus a quality cycle track. Elsewhere on Madingley Road we find this insulting less than 1m wide track, that regularly floods, doing dutry as both cycle and foot path. These photos of Cambridge were taken a couple of years ago, and there may have been some changes since. I have shown some bad things, that I just happened to come across, and which seemed typical, and not gone out of my way to find good facilities. It did seem that very, very little had changed since I lived there in 1987. It will be interesting to see what the Embassy tour is shown by the Cambridge cyclists, and I will report on that in due course. My overall message, however, which I think is unlikely to be disproved by what we are shown tomorrow, is that cycling provision in the highest-cycling city in the UK is pretty dismal when compared to that in highly comparable cities on the continent, and that this accounts for the narrow demographic of Cambridge cycling, the failure of the city to create a mass cycling culture of "everybody doing it", that you see in places like Münster, and the resulting "them and us" situation with continuing local political and media hostility to cycling in Cambridge. Münster, and the cycling achievements of other German cities, remain surprisingly little-known and little-understood in the UK. Cyclists in the City covered Berlin's aspirations for 20% cycling in the next decade yesterday, but nobody has bothered to translate the Münster Fahrradstadt Wikipedia article into English. I hope to see some readers on Safari tomorrow, and to find out how the Cambridge cyclists think their city can progress. Good post as always David. I like Cambridge a lot, as you'd probably expect given that I lived there for nearly two decades. 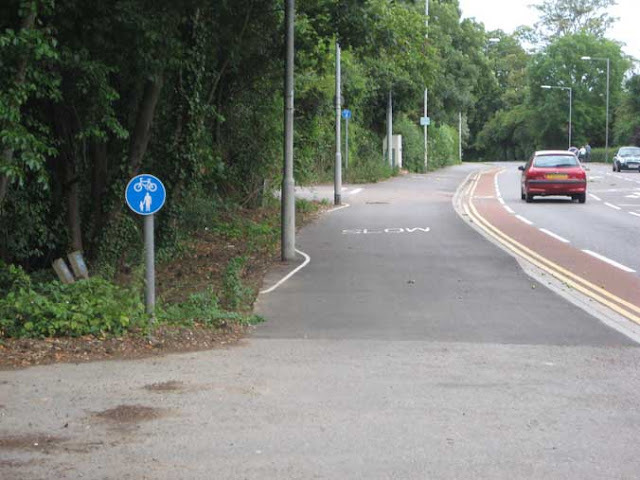 However, the effort put in by the council on cycling is simply not adequate. Again and again you're let down if you choose to cycle in the city. There's altogether too much "excitement" involved in everyday journeys by bike. Some people manage to ignore this. Some people give up on cycling. Eventually this was a very good part of what drove us to emigrate. I'm looking forward to reading your thoughts about Cambridge after your visit. Yes, very interesting what you say about the agreement between Cambridge City and the University stopping students from having cars. I'd never heard of that. My impression of Cambridge is, as you say, apart from students, many of whom seem to need cycling lessons and make pedestrians' lives a misery, that the city is, like the rest of the UK, completely and utterly obsessed with the private motor car, and that the whole of life is made to revolve around the monster. Just try getting into Cambridge on the bus in the morning, and you have to start out before 7am unless you want to get stuck in the most insane traffic jams and near-gridlock. This country is cutting its own throat in its obsessive lust for the status of the private car. A miasma of collective insanity for which there appears to be no cure. Shame, as Munster looks lovely to live in. We could be like that, only can't see us being that sensible somehow. Something that I thought might be relevant to this. 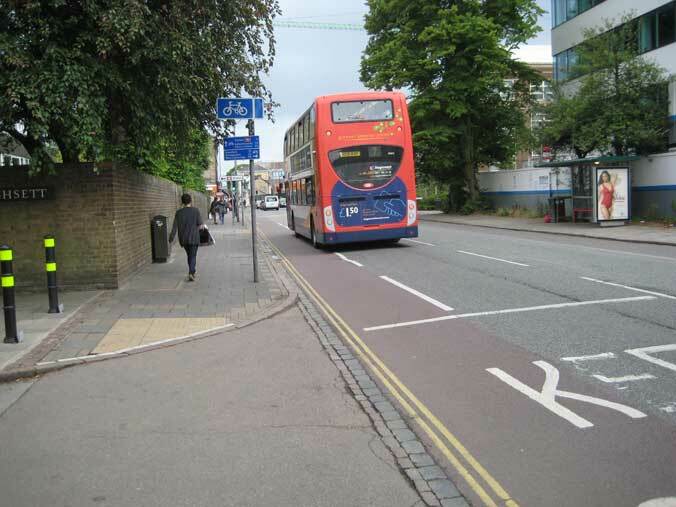 You write about how though Cambridge has a large population of students that cycle everywhere, the city lacks decent cycle infrastructure. I just went to vote in the local elections today, to elect the people that in reality, as I'm sure you know, get to choose if cycle infrastructure gets put in or not. As I was getting ticket off I noticed that out of the 300 or so names listed on the sheet that contained mine only 6 or so had voted. Even taking into account a few stragglers coming later, that means there often can't be more than 5% of students voting. 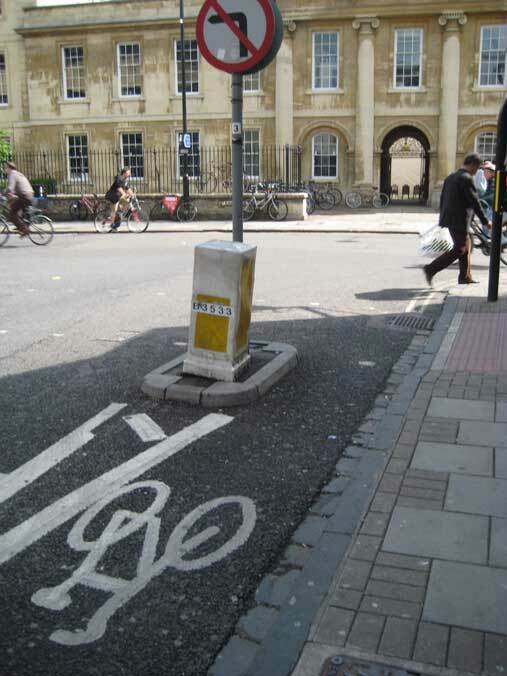 If the most heavy users of bikes in the City aren't representing themselves politically, the I suppose that goes someway towards explaining why most of Cambridge's road system is so geared towards the motor-car. Indeed. Market, which I would think of as the ward with the largest number of Cambridge students, had the lowest turnout at 22.7%. However, a lot of students don't cycle either. If you're at one of the central colleges most things you need are within walking distance.